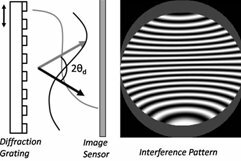 Wavefront sensing describes phase sensitive detection from optical path differences within a field. 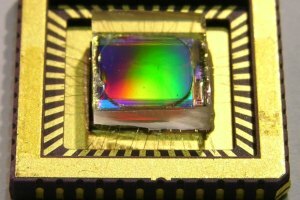 Optical wavefront sensors map phase information into intensity for detection and are found in metrology applications ranging from corrective vision surgery to adaptive free-space communication. However, most sensing modalities force a tradeoff between dynamic range and sensitivity. Our system uses only a diffractive element and image sensor integrated together to act as a lateral shearing interferometer. Variable diffraction gratings such as spatial light modulators, allow the system to adjust shearing parameters for optimal performance. Grating-based lateral shearing interferometry overlaps shifted diffraction orders to form an interferogram within the overlapping area. 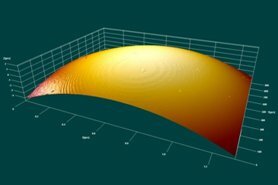 The contours associated with the fringe pattern differ significantly as the lateral shear distance changes, because no known reference phase front is present as in Michelson or other conventional interferometers. Incorporating a linear tilt places a carrier fringe within the interferogram, thereby modulating the phase contours. Simple Fourier analysis allows the signal to be demodulated recovered. The importance of interferogram modulation is to provide a method of encoding the wavefront signal into pertubations in carrier periodicity. Overalpping different portions of the wavefront has a direct effect on the wavefront signal strength. Adjusting the amount of lateral shear allows the sensitivity to be maximized. Liquid-crystal spatial light modulators show promise in bringing shearing variablility, however the system demands very small pixel pitches which are not available commercially. The system is currently built with a fixed, binary phase grating to show a proof-of-concept and explore the theory and improvemets over other sensing technologies. J. Karp, T. Chan, and J. Ford, "Integrated diffractive shearing interferometry for adaptive wavefront sensing," Appl. Opt. 47, 6666-6674 (2008).